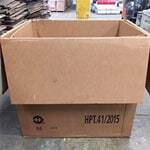 Used 30" x 30" x 24" Gaylord Boxes - 3 Walls - Madison, Wi. 30" x 30" x 24"
Located in Madison, WI we have 1500 used gaylords available. These are square boxes, full flap bottoms.